Simply put, a disaster is a catastrophic event that overwhelms available resources. Disasters can be natural or anthropogenic (caused by human activity). In May 2016, a fire in Fort McMurray, Alberta, destroyed 2,400 structures in the area, forcing more than 90,000 people to evacuate the region. 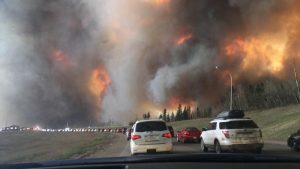 “Landscape view of wildfire near Highway 63 in South Fort McMurray,” by DarrenRD, is licensed under a CC BY-SA 4.0 International License, via Wikimedia Commons. Natural disasters such as tornadoes, earthquakes, floods, and extreme winter conditions occur more frequently than anthropogenic disasters such as civil unrest, terrorism, and armed conflict; in 2015, there were 376 naturally triggered disasters registered (Guha-Sapir, Hoyois, & Below, 2015). Disasters are typically considered “low probability, high impact” events (Saunderson Cohen, 2013, p. 21). Planning for any type of disaster requires consideration of common elements including mitigation, preparedness, response, and recovery. Canada’s Emergency Management Act recognizes the roles that all stakeholders must play in Canada’s emergency management system including “coordinating emergency management activities among government institutions and in cooperation with the provinces and other entities” (Emergency Management Act, 2007).